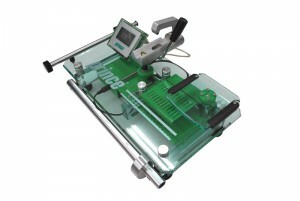 We have a Racket Diagnostic Machine in store which helps us to identify how to customise your racket. To add weight to a racket is easy BUT to do it properly by placing weight in a position that suits you is not. The diagnostic machine tells us the rackets current weight, its balance and its swing weight. We can change your racket to a head heavy balance, a head light balance or an even balance and we can alter or maintain its swing weight. There is no right or wrong here as we all have different styles of play but through discussion we can advise what might suit your game. Depending on what you want from your racket we use weight, balance and swing weight and run those numbers through the customisation programme we use and that gives us a few options for where we could add the weight. It is a service that does need face to face contact so pop in and talk to us we are happy to advise. The diagnostic machine is also a really good piece of equipment for matching rackets, when you purchase multiples of the same racket there are variations in weight and through taking the measurements we have already mentioned we can make all of your rackets the same, if you have a favourite out of your rackets more often than not we can make your others the same (providing they are lighter than the one you like most).